Stanford University earned the No. 1 ranking in this week’s USRowing/Collegiate Rowing Coaches Association NCAA Division I Varsity Eight Coaches Poll, while Mercyhurst College took the top spot in the Division II poll. Stanford was the unanimous choice in the Division I rankings, earning all 25 first-place votes. The University of California ranked second, followed by Yale University. University of Virginia and University of Michigan rounded out the top five. Mercyhurst received three of the four first-place votes to remain atop the Division II poll. Western Washington University ranked second, earning the other first-place vote, followed by Seattle Pacific University. The final Division III poll was released last week. USRowing is a nonprofit organization recognized by the United States Olympic Committee as the governing body for the sport of rowing in the United States. USRowing’s Official Suppliers are Hudson Boat Works and Boathouse Sports; its Official Patron is Concept2; its Official Electronics Outfitter is Nielsen Kellerman; its Official Timer is Powerhouse Timing; and its Preferred Printer is Sport Graphics Printing. USRowing also receives generous support from the National Rowing Foundation. 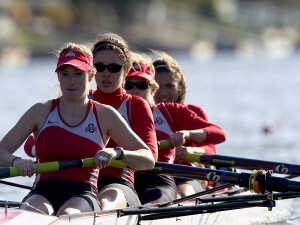 The Collegiate Rowing Coaches Association’s official partner iswww.row2k.com. Others Receiving Votes: University of California Los Angeles 11, Northeastern University 11, University of Pennsylvania 3, Bucknell University 1 and University of Central Florida 1.